Maturity Matrices are a term given to what is essentially a “checklist” whose purpose is to evaluate how well developed a particular process or program is. It is a rather grand name for what can be a very simple paper-based system. However do not let the simplicity give a false impression! 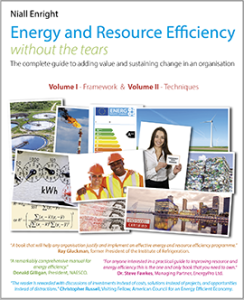 Maturity Matrices are one of the most powerful tools in the armoury of any environmental professional! In a maturity matrix you would rate the current state of development of your program, and then repeat the process at a later date and so determine if you have made progress. One of the most common Maturity Matrices is the Carbon Management Matrix, which currently available from the Carbon Trust, illustrated below. 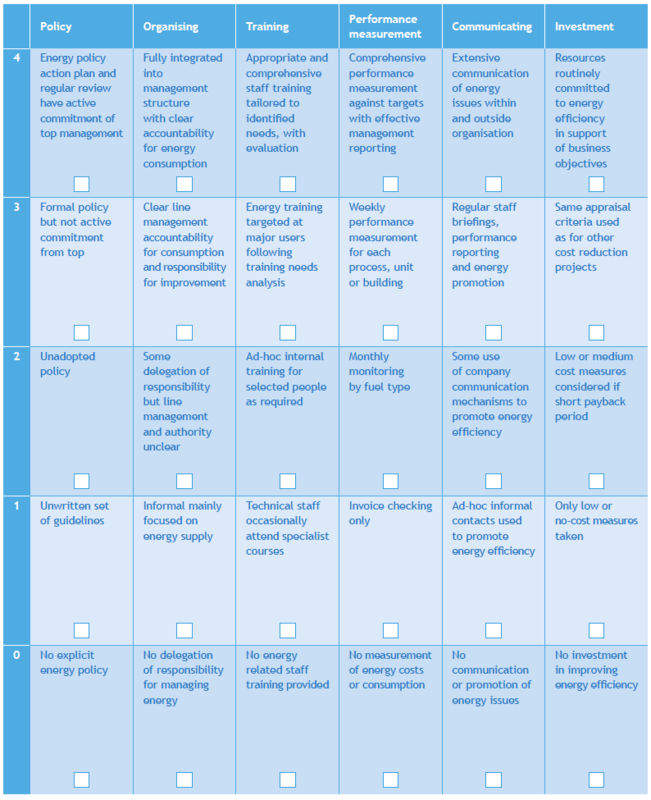 As you can see the Matrix consists of a simple set of statements in 6 themes from Policy through to Investment, against which the user can rate their energy management program on a scale of 0 to 4. The Matrix enables a conversation around energy management that reflects a wider set of subjects other than just technology (the default solution for many). It tells us that aspects of Organising, Training, Investment, Communication and Performance Measurement are all important. This is one of the great features of these kinds of matrices, that is to say that they are educational. We can sit down with a management team in an exercise notionally to help them establish their own program objectives but what is really happening is that they get an appreciation for the key themes are and what excellence looks like. The tool is also a powerful way of understanding where barriers might exist in an organisation. If the engineers say that there is little or no investment but the finance team say that investment is good – then we clearly have an interesting topic of conversation. Maybe the issue is one of a lack of finance or maybe the quality of the proposals from the engineers are not good enough. Either way once this is on the table we can begin to work on it. As we mentioned earlier, the matrix provides a way of measuring progress over time. However one thing that we often do is to use the discussion where our current performance is being rated to ask the participants what they feel our target should be for a particular theme. This enables us to see what the key priorities are and to establish if we are setting ourselves realistic objectives. If you want to learn more about Maturity Matrices why not head over to Niall Enright’s article on the subject. Themes, like “Policy” above, may have several sub-themes or Topics associated with them. For example within the theme “Leadership” we might have topics on “Policy”, “Management Commitment”, “Organisation”, “Standards” and so forth. Adding or removing topics is easy. The Framework has been designed for workshop situations where the participants responses are captured “live”. Thus easy of use is absolutely critical as the facilitator might need to revise entries quickly or rapidly capture actions. “Edit” and “Entry” modes are separated so that during this live interaction it is not possible to accidentally delete text and rules in the sheet. “Entry” mode requires a password providing further protection. The colours of many framework elements, like the grid of responses, are customisable and many features can be enabled or disabled at will (see Settings below). There a several data entry modes from an “all topics” mode where you can see all the questions (as in the matrix above). through a “step-by-step” or even a pop-up dialog entry mode where scores are set by simply clicking the mouse or hitting a space bar and choices are supported by drop-down boxes. For each Topic you can rate the current position and where you would like to be. There is room for comments on the scoring, and the ability to set a priority, define an action and the person responsible, as well as the time-scale for completion. Thus during the selection of a target for a given topic the participants can see, if desired, what the Standard requirement might be which can help them judge how important this aspect of their program is. For each step in the Matrix it is possible to enter advice to indicate what actions can be taken to move from one level to the next. These can be shown (or hidden) during the interaction with users as desired, or they can be incorporated into the report that the Framework produces. In the image below the suggestions are the columns on the right in yellow. There are two suggestions in the first topic as the matrix indicates that the desired target is two level above the current rating, while for the next topic there is only one suggestion. 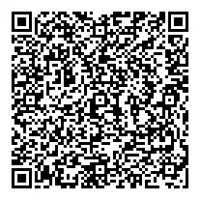 Unlimited Questions and Document Links to each topic. For each topic it is possible to prompt the user to answer some specific questions, as well as to show links to additional documents and resources. In the image to the left we can see that for the first topic there are two questions, both of which have been answered (2/2) and a link to (3) relevant documents. Double-clicking either cell takes you to relevant Question or Document. Below we can see the Q&A sheet with the answers previously completed. When creating the questions, date, number, text and yes or no options are available. Click on the big “Back” button to return to the main Theme entry sheet- navigation throughout the framework is by clicking on these simple menus. Each complete theme has a series of summaries, which can include (if desired) bar chart and spider-chart. At a click of a button a PowerPoint Presentation featuring the current data is produced (either as a new presentation or an addition to an existing presentation if one is open). 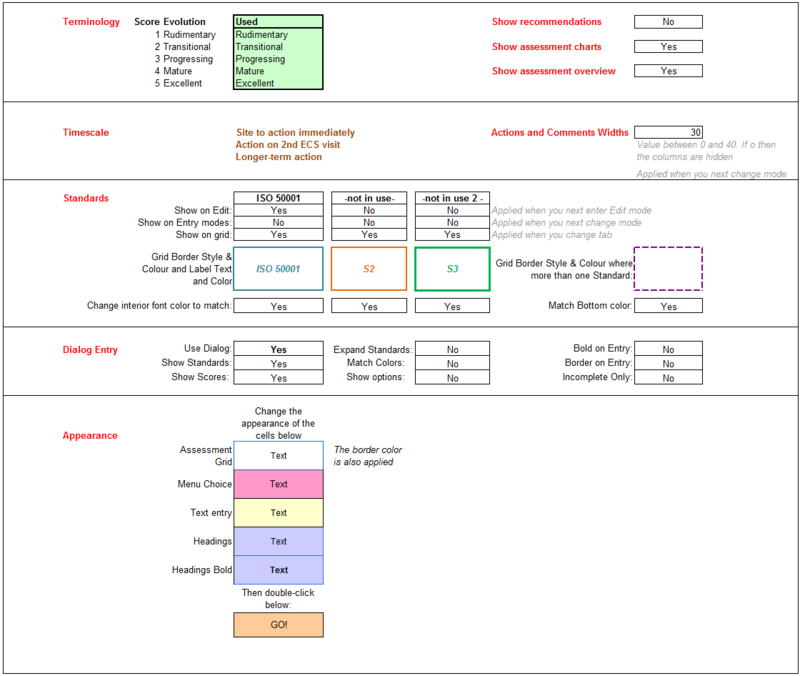 The image to the left is a PowerPoint slide illustrating the Overall Summary, but slides can be generated for individual Theme summaries (with or without charts), detailed Theme entries (again with charts) , and for Actions (using the desired display settings). In this way a rapid presentation to accompany the workshop or data-gathering session can be produced. It is easy to delete unwanted slides and to re-organise them to create the desired emphasis. The slides can be sent to a base “template” presentation so the presentation is always in the appropriate corporate image, not the SustainSuccess style shown here!. 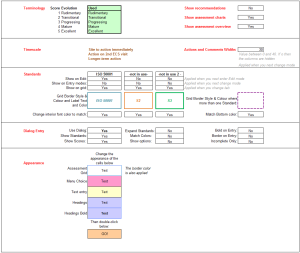 All the actions captured in the course of the workshop are save on an Actions Overview sheet, which can be filtered or sorted in by priority or themes as needed. Individual actions can be excluded from the lists if they need further refinement prior to publishing – which can be done with the one-click PowerPoint export. 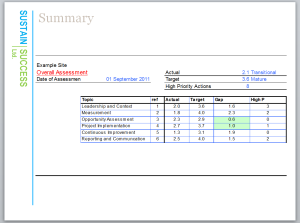 Multiple assessment captured, compared and reclaimed. Each completed session where the Matrix is filled-in is called an Assessment. 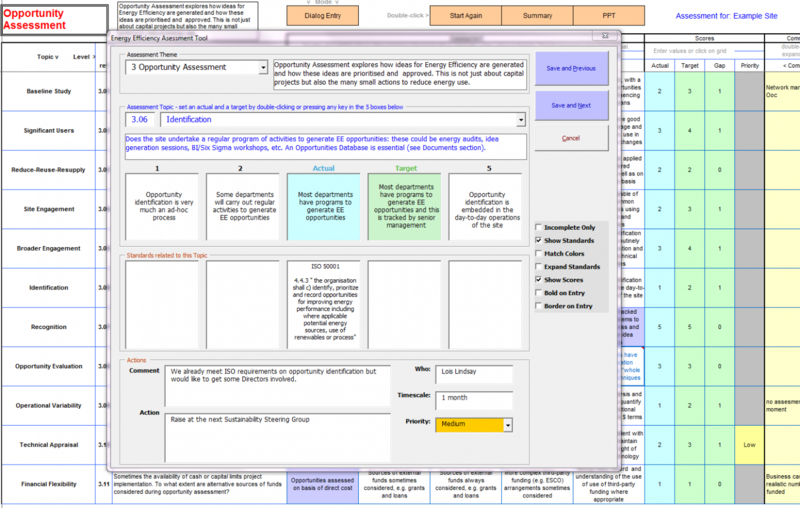 The framework allows multiple assessments to be completed and stored – enabling comparisons between sites for example, or between teams or for progress over a period of time to be assessed. Below you can see the results of four assessments: with the Engineering, Management Team and the program Champion as well as the assessment currently in progress (when that is saved a unique name will be requested). The framework is highly customisable, with the appearance of many elements set using this Settings sheet – simply set the desired style of the appropriate cell, press GO! and its appearance will be replicated as appropriate throughout the framework. 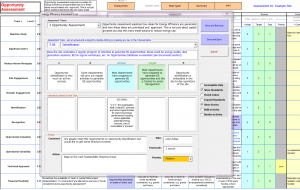 Features such as Suggestions, Charts and Overviews, as well as highlighting individual Standards can all be set here. If a dialog-box data entry is used (which is particularly useful when using the framework on a large-screen projection) then aspects of the dialog can be tailored to suit personal tastes without recourse to any visual basic programming.